Cupcakes and Pie Oh My! So we’ve been busy. I guess all that sickness has really brought out the productivity in Z and me. We’ve declared daylight hours to be T.V. free (I’m banking that’s probably going to go out the door tomorrow, but hey, I tried), we’ve been super crafty by making things like bird feeders our of lemon bags, AND, we’ve been baking. Yesterday I was feeling a little rough around the edges, my throat was raw but my child was WELL!!! Therefore, I was FINE. I knew she was fine because she asked to make cupcakes. 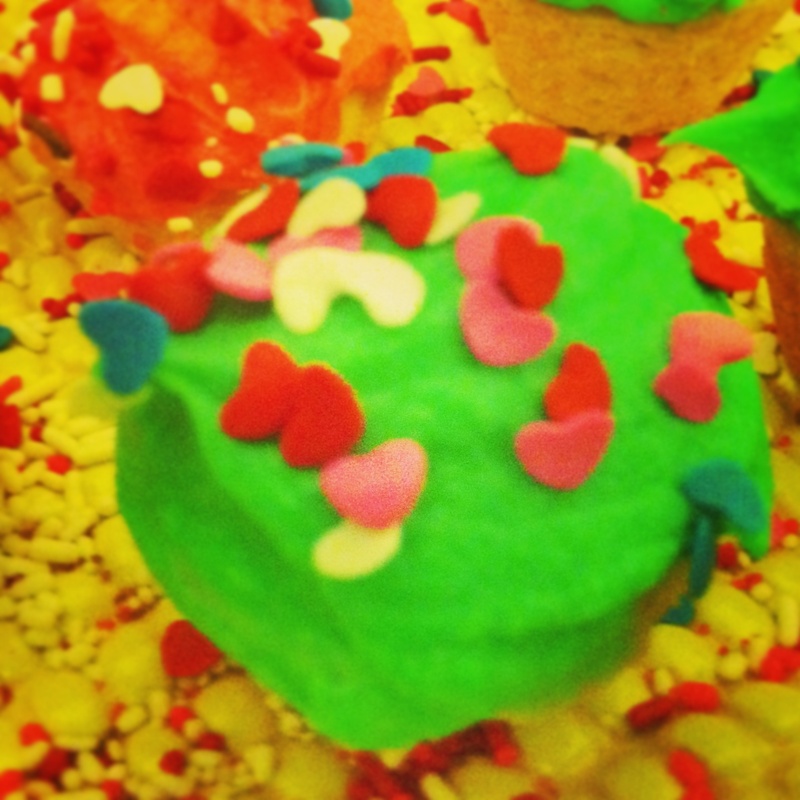 Not just your run of the mill cupcakes, but lemon cupcakes with colored icing and sprinkles. I decided to go all out. This recipe is easy-peasy. I used my lemon cake recipe I blogged about earlier, and added 1/4 cup of shredded coconut to the batter. Take a mixer (I use a handheld and I let Zara do this step, she’s getting really great at holding and controlling the mixer and I’m right there so I can help her if she thinks it’s too heavy or she’s tired and then we switch off, she adds items and I mix) and beat the butter until it is light and fluffy, about 2 minutes. Add the milk and confectioner’s sugar and continue to beat on low until all the sugar is incorporated with the butter. Add the coconut essence or extract. That’s it! We divided the frosting into 4 bowls and dyed each bowl a color (white, green, pink and blue per Zara’s request.). 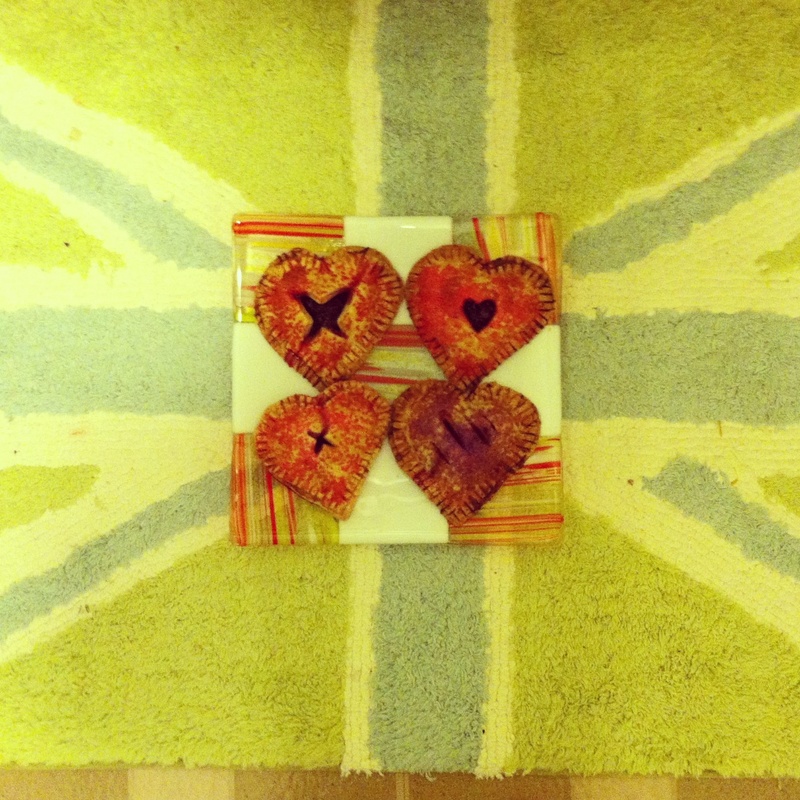 Since we made baby cupcakes, we added the batter into buttered tiny muffin pans and then baked at 350 F for 11 minutes. 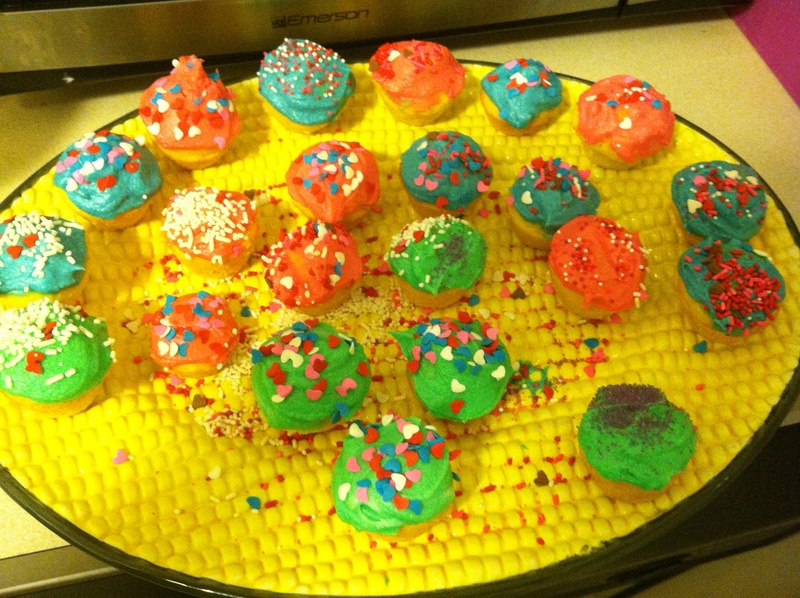 Let cool for about 15 minutes before you try to ice cupcakes, otherwise the icing will melt right off. I set up a place setting for Zara at her table that had a couple of cupcakes, the 4 bowls of frosting and some bowls of sprinkles so that it was easy for her to decorate the cupcakes, I felt less frustrated with the mess, and we could ice and decorate the cupcakes. It was a MUCH more enjoyable experience than trying to do all the cupcakes at once. Relish the mess. It WILL be messy. But your kid will LOVE it. Trust me. Then, when you’re done decorating, and if you’re lucky, you’ll have leftover icing. We dipped pretzels in ours. EPIC WIN! So that was yesterday. Today, we made handheld pies. I saw this on Pinterest, or on another blog. I’ll try to remember where, but Meg Roke, a fantastic knitter I remember is how I saw the picture, instead of following whatever directions (and since I obviously don’t remember where I saw this), I just decided to try to make something from memory (of the picture). It actually was WAY easier than anticipated, and the look amazingly cute! 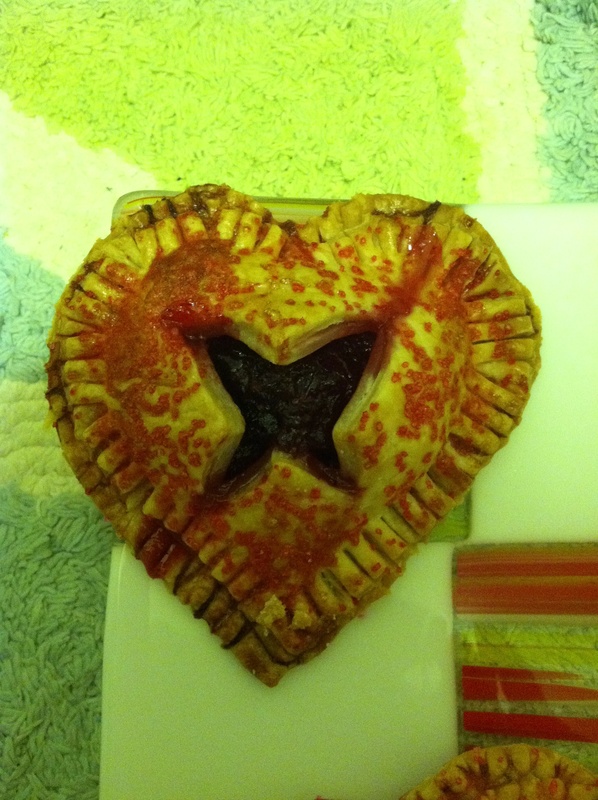 First I took ready made pie crust and had Zara press into hearts using a heart shaped cookie cutter (thanks mom!). I then filled with either Peanut Butter and Homemade Jam or Zara filled with just jam. I then cut a small shape or scored the top of a heart that had no filling and placed that pie crust piece on top of a filled one. Zara then pressed a fork along the edges to seal (similar to an empanada). We used a child-sized fork so it was easier for her to handle, AND she loved that she was using one of ‘her’ forks. I then brushed with an egg wash and had Zara choose sprinkles to decorated. Bake in a 350 F preheated oven for 15-20 minutes. That’s it! They are gorgeous! Cupcakes look wonderful and I’m sure she had fun making.